It didn’t matter how many times Mike read the collateral exam; he couldn’t shake the feeling that something was off with this prospect. Meanwhile, Darren, the experienced relationship manager for the potential credit, developed a twitch of his own as he piled intrusions into Mike’s day. “Can I tell the XYZ Company we have a deal?” “When is underwriting going to be done?” “The prospect is talking to other options?” “We’re going to lose this deal today.” The escalations continue to climb. This credit was tricky. XYZ’s current lender asked them to leave the bank and put the screws to them to see that it happens quickly. The credit wasn’t going to be easy. Mike knew the portfolio team could handle the collateral. The field exam had given the usual caveats, but there was a way to wrap a deal around the issues. However, it was clear the company was in a turnaround situation. Their current bank wanted them out in the worst way. The company had retained a turnaround consultant and, as a result, was introduced to Mike’s institution. The underwriting process so far was smooth: Mike and the team had toured the company, met management and asked questions. Management, with the aid of the turnaround consultants, was able to answer almost every question. What they couldn’t answer, though, was what happens when the turnaround firm leaves? Mike questioned if the management team that got the company into this mess were really the guys that could get them out. He needed to decide if this turnaround would actually finish or if he was simply taking on a liquidation rather than a client. Time was ticking and the only thing holding up the deal was a gut check. Mike confessed that he didn’t understand management. How do they expect to turn this company around when availability will be tight? The cynic in Mike wasn’t sure how long it would be before management came back and asked for an over-advance as a bridge for some sudden unforeseen issue. Mike decides to underwrite the deal subject to an independent review. Darren chokes, feeling his commission slip away. But Mike has one more trick up his sleeve. He needs five days to close and in that time he wants one more pass at the review. Mike reaches for the phone and calls Newpoint Advisors Corporation for a TAMETM interview. He gives the green light to legal, conditioned on this test. XYZ’s management team has worked with a consultant to make a plan. The turnaround has started, but is not complete. The consultant can’t stick around much longer due to cost, and the question is, can management hit the numbers? Mike is troubled by two unknowns. First, the field exam can’t tell him if management is capable – it simply tells him that management can organize most of the records. Second, the cash flow budget doesn’t say anything about management’s capacity to hit the numbers. Mike foresees that, in a few weeks, costs will decrease after additional cuts are made, and he can see that, in a couple months, some asset sales will take his expose down to a more reasonable level. However, that’s all in the future. Can they really accomplish this? How does Mike know that XYZ won’t digress as soon as the bank and consultants are gone? Mike needs to understand how they are going to turn the company around. Management has some metrics in place to track operations, but most are new and not tested. Prior to that, management didn’t measure things that seemed to matter to them. It’s typical to have a limited amount of data about management performance other than the fact that a turnaround is happening. So Mike hires Newpoint to review the company. Within hours the TAME interview process starts. Newpoint used their proprietary diagnostic tool to measure the likelihood that management could pull out of this situation. TAME is a way to back away from the financial numbers and examine not only how management conducts itself, but how the company functions on a day-to-day basis. It seeks out immediate threats that would cause a turnaround plan to fail. TAME makes an operational connection to the numbers in a cash budget or a plan. It gets inside management’s head and scans the workflow and communications at the tactical level to determine if management has the ability to work in a focused way and communicate and execute crisply. TAME quantifies softer topics like culture, infrastructure, data availability, and outside influences to derive a score that points to a likelihood of a company making it or failing. Below is one of several reports that come out of a TAME report. The key is the simplification of the results of a complex and data-poor situation and the ability to determine your confidence in lending. Three days later Mike receives his assessment. He reviews it and studies the numbers. He finds comfort with the deal that he could not have imagined. 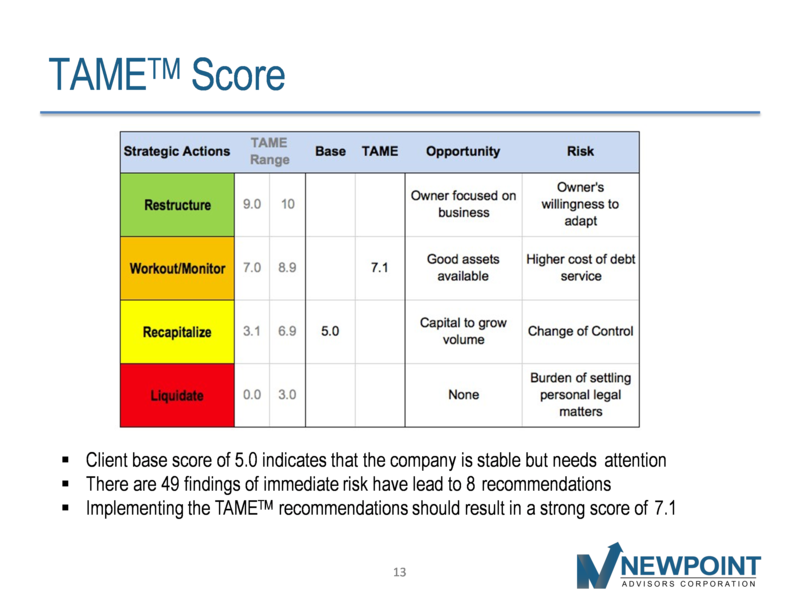 TAME unearthed three things that XYZ’s management struggled with that threatened this credit. Instead of wondering what or when the turnaround was going to spoil this relationship, he was now armed with three communication points that management could work and report on weekly in order for Mike to monitor the credit. Additionally, Mike and his people could work with XYZ’s management in order to complete the turnaround – a game changer in terms of attitude. Tim pulled up the client’s spread sheet on the video share screen. Joe,* our client, moaned as he focused on the list of past due clients. His eyes scrolled, exhausted, past the list of over 90 days. This was going to be a long collections conversation. Joe is pretty good at what he does; for over 35 years he has been completing projects for his active and loyal customers. But here’s where it gets strange: like so many contractors after the Great Recession, Joe got in the habit of just taking whatever customers would give him. Instead of fighting for his piece of the pie, he begged. It happens to everyone eventually. Joe lost his edge and was never able to recover. While he still completed his projects well, Joe was tired and forgot that collecting was part of the project. He was so focused on the volume in the next project, he forgot to follow up with his clients. He was so wrapped up in keeping his crew busy he didn’t stop to concentrate on payments. But Joe is no dummy. He made the calls and barked at his staff when collections were slow. But in his haste to keep the project pipeline going, project follow-up kept on sliding. In addition, he missed a tremendous opportunity to meet with his clients and make sure the project went the way it was supposed to. The nuggets of knowledge he would have gained in those meetings could have changed his business, but for some reason, he could not bring himself to engage with clients. Then the economy improved. The work grew, but there was this nagging issue of cash flow. So Joe did what any successful entrepreneur would do: he sold more work. Anyone who knows the small business world will tell you to take the sale; consistent volume is hard to come by. But the growth didn’t help cash flow, so he reached out for a line of credit. That helped a little but soon, many of his clients weren’t paying him for upwards of 200 days. Joe decides to double down and goes for the big volume project. He knows the GC and trusts he will take care of him. Two YEARS later, the project is wrapped up but Joe still hasn’t been paid. Countless conversations get Joe nowhere and he’s on the hook for a lot of money. Loan fees have dried him up and Joe, the good guy that he is, stopped taking a salary. He’s drowning fast. It’s week three for Newpoint and we’re talking collections. Joe is exasperated as we go down the list as he repeats, “they are going to pay,” “they said they would pay,” and “I don’t know the status.” 1/3 of his clients are over 200 days past due. There’s even one that’s over 800 days, yet Joe continues to insist, “he is good for it…” When we share his cash cycle with him, he’s stunned to see how far he really is stretched with all his projects. As we dig into the story behind each collection, we find that Joe has very little insight into each situation. Simply asking Joe for a date on when he will get paid becomes a hide and seek game which then evolves into a confession: “I don’t really know.” So we relearned the art of asking. Since it had been some time since Joe had asked his clients about payment, his pitch was a little rusty. To his amazement, not only had the rules changed but the contacts had, too. Joe was really not doing well. And unfortunately, in his “fire and forget” approach, Joe had also forgotten to follow up on the paper work, too. When he could find his customer, he would find out that he had not completed the proper paper work, that he had to resubmit this, find a copy of that, or in some instances go back to the project and fix something. But what was Joe really missing? Was it the paper work? Not really; that was just a symptom. Sun Tzu, an ancient Chinese warrior, weighed in on the matter. His greatest line is, the battle is already won before it begins. In this case, it means that successful collections have almost nothing to do with collections. Poor Joe is running himself ragged trying to get more sales but what we find is that he had not properly prepared himself for the battle. Joe got it in his head that sales equal wins. While sales help, you’re not a true entrepreneurial warrior until you have collected the spoils of war – cash from the sale. We did help Joe collect an awful lot of money over the next several weeks, but it wasn’t the big win he hoped for. The warrior technique he has learned is preparation. He needs to be organized before the invoice goes out. His invoice needed to be backed up with details about his time, labor, and site check offs. And for this he needed standards. Standards are the things that prevent exceptions like, “I forgot,” “I did not know,” “this project was different,” and “I was too busy to get to it.” The list goes on but the point is that projects have beginnings, milestones, and ends. Each has to culminate in a set of check offs and reports. Define the standards, communicate them, and hit them. Check that you hit them. When you’re done, you’re prepared to invoice with your documentation in order. It is so in order that you feel good about it and you lead with it. You’re proud of how tightly you have completed the project and you know where you had issues. This proud preparation motivates you to sit with your client and talk about what you know and what you have learned, and allows you to lead with a collections effort. Good documentation moves faster through the system and helps your client get through their accounts payable process more quickly. This allows you to win the collections battle. On the other hand, bad preparation is a losing battle. When you don’t document well, you’ll have to go back later and do it again to get it right which is always more expensive. Collections is not a phone call game of cat and mouse. It’s a shorter battle and one that allows you to avoid slow, anemic, payroll-threatening cash flow. These rules apply to all industries. Joe is working on his standards, Sun Tzu is still right, and the next cash flow battle is yours to win. Be an entrepreneurial warrior: prepare to be your best by carefully documenting sales in preparation for your collections.